Laundry bags are supplied for hotel use for their dirty laundry when it is transported from hotel room to their on-site laundry or to a commercial laundry company. Laundry bags are supplied in two different shapes and sizes and are usually made from texturised polyester for strength and durability. The hamper shape laundry bags are oblong with carrying handles and are supplied in a range of colours. The kit bag shape laundry bags are fastened with cord through eyelets around the top of the bag, with two side handles and one base handles and are supplied in a range of colours. 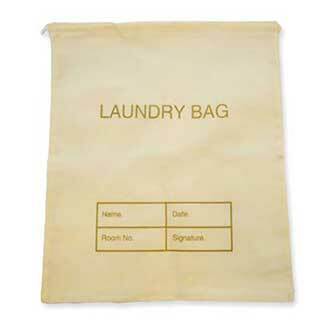 Our PVC laundry bags are specifically designed for hotel guest’s laundry. Guests' linen is placed in the laundry bag, laundered by hotel staff and returned to the guest. PVC laundry bags are made from good quality white PVC with plastic strip drawstring. 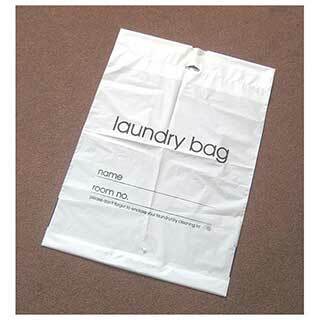 Whatever the application www.supply2hotels.co.uk can supply laundry bags to suit your needs. Manufactured from 100% polyester this laundry bag is similar in shape to a kit bag. This laundry bag is designed to help with quick changeovers of guest accommodation. This laundry bag has reinforced eyelets at the top edge and is fastened by cord. The extra large 72x80cm has the capacity for strippling multiple rooms. Perfect for any size hotel, guest house, holiday accommodation or for professional laundries. Dimensions 800(H) x 720(W) x 450(D)mm. Drawstring oblong hamper laundry bag is manufactured from texturised flat weave polyester. This laundry bag is oblong in shape. 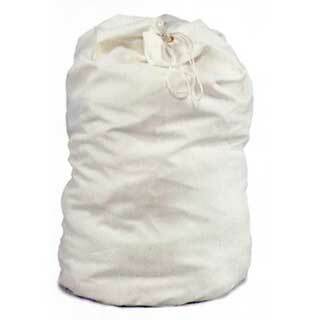 Used by many commercial establishments for transporting and storing ironed linen and laundry. This laundry bag has 4 corner lugs with eyelets and a drawstring fastening. It has 2 side carrying handles. Available in Royal Blue, Yellow, White, Green. Red. Orange, Brown, Dark Grey, Black, Turquoise, Pink, Navy Blue and Dark Red. White PVC laundry bag with plastic strip draw string. Good quality PVC. Guests' linen is placed in the bag, laundered by hotel staff and returned to the guest. Size: 390mm wide x 540mm high. Cream hotel laundry bag manufactured from good quality canvas fabric with drawstring fastening. Washable and re-usable canvas bag measuring 45x55cm. Can be marked with hotel room details. Guests' linen is placed in the bag, laundered by hotel staff and returned to the guest. Available in cream only. Sold singly. MINIMUM QUANTITY 20.